Romero was born in New York in 1940 and began his career making short films. In 1968 he released his first film, the groundbreaking and subversive Night of the Living Dead. Filmed in black and white at a cost of just $100,000 the film has become a classic and contributed greatly to the development of the zombie genre and horror films in general. It was criticised upon release for being gory but graphic depictions of violence were soon to become common place in horror films. Over the next few years Romero made a few films, most notably The Crazies in 1973 which is about the accidental release of a biological weapon on a small American town by an inept military, and Martin in 1977 which provides a fresh twist on the vampire genre. In 1978 it was time for the next part in Romero's zombie odyssey. Dawn of the Dead was a hugely successful film and essential viewing for any horror fan. It has been frequently referenced in popular culture and like Night of the Living Dead it combines social commentary and criticism with gory adventure. In the early 80's Romero made Knightriders and Creepshow before returning once more to zombies with the extremely dark Day of the Dead in 1985. Monkey Shines followed in 1988, then there was Two Evil Eyes in 1990 and the Stephen King adaptation The Dark Half in 1993. After that Romero seemed to get lost in Hollywood hell with a series of potential projects which never took off. It wasn´t until 2000 that he released another film, the universally and unfairly panned Bruiser. In 2005 he returned once again to the living dead with Land of the Dead. This was a fairly big Hollywood production although it still had a much lower budget than Zack Snyder's Dawn of the Dead remake released in 2004 ($16 million versus $28 million). Land of the Dead was a decent contribution to the series and although received less favourably than his previous efforts it was very commercially successful. 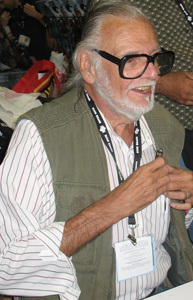 Romero found making it "gruelling" and decided to return to smaller productions where he could exert more control and have a "working-with-friends environment". In 2008 he released Diary of the Dead which received mixed reviews. At the age of 68 Romero is still making horror films. The great shame of his career is that he didn't get the opportunity to make more films and he has spoken about his torrid time in Hollywood where he found it difficult to get his movies made despite his growing profile. He is now reportedly working on a new project which is as yet unannounced.